In my early days with Harv -- back in North Carolina -- he lived at a 14 stall co-op barn, Theys Farm. Owned by an elderly man (Mr. They himself), the farm was a former dairy operation that had fallen into disrepair. Still, it had a run-down charm of its own, not to mention huge pastures. The main barn opened out to a tree-lined paddock area, and in one corner there was an old picnic table where co-op boarders congregated. On nice mornings I drove to the barn out before work to share breakfast with Harv. I'd walk him out to the paddock, throw him hay near the picnic table, and then take a seat myself. Me with my yogurt and coffee, Harv munching hay nearby, and not a soul around but a few peacocks. It was so peaceful. I can't think of happier times in my horse life than those moments. And I loved that farm! Very recently I learned that Mr. Theys died in 2008 at the age of 89. I google-mapped Theys Farm address recently, fearing that satellite image would show a subdivision. To my delight, the farm is still a farm, but not a horse farm. Farm Front Gardens is owned by a young couple who are into sustainable agriculture and they grow a bunch of stuff. What are your happy horse places? Sitting in my horse's stall just being there. I also boarded at a kinda coop barn, somewhat run down also. The people there all pitched in and it was such a nice atmosphere. It had the least barn drama of any place I ever boarded. It was my favorite barn i boarded at. The first is the look on my horse's face when he is wearing his saddle and I walk up to him with the bridle. I still feel elated like I did when I was a little kid about to get my weekly lesson. I love that moment. The second is hugging the enormous face of the late bay mare which I leased before Harley came into the picture. She was a sassy girl, but she always stood still like a statue and dropped her neck when I hugged her face, which was the length of my torso. I do miss her. I love riding a really extended trot. When I post up I feel like Kate Winslet on the bow of the Titanic, with the wind in her hair, just flying. 'Course I don't LOOK like Kate Winslet, but that's another story. That's exhilaration, though, and happy (as in deep down to my toes happy) just comes from the aroma of my horse when I hug him. I love sitting in the grass while my horse is grazing nearby. He'll slowly wander towards me and away and then back again. My second favorite is anytime my horse lets out his "I'm content" sigh. It always relaxes me to know that he's happy and content whether we're riding, grooming or standing for the farrier. Standing in the barn aisle with Keil Bay after a ride. He stands with me by the tack room door while I untack and give him a rub down, and then a handful of oats. It's a sweet time. And usually at least a few times a week I'll be mucking stalls or doing some chore in the barn and one or more horses will come in from the pasture and hang out with me. I used to board at Theys Co-op! That very place holds my fondest memories with my horse Sam. I learned to jump on Sam there, and shared some fabulous times. Sam had to be euthanized in 1998, and I miss him dearly, but will forever cherish the memories of him and They's. It was the hours I spent with my boy Bear (who died of liver cancer last year) when he was stall-bound for so long and I would entertain him to keep him from going crazy. 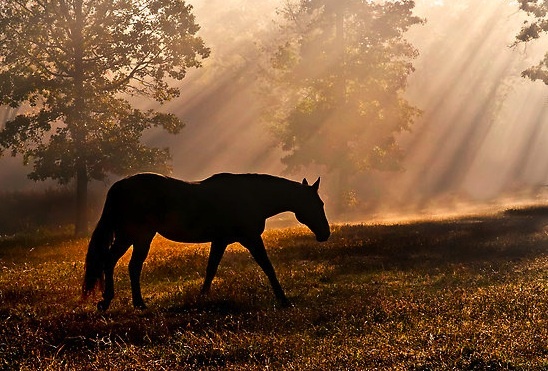 Losing your horse is closely akin to losing a child truly. But the hours we spent together in my little barn (which I wish for sometimes) were the best! Curry and brush... the simplicity of it is glorious. Even after a crazy day of going and doing well past the 8 hour mark, I can't just let go of the drive to "do" when I get to the barn. But I can curry. And I can brush. Its the closest thing to meditation I think I'll ever get. Productive enough to allow me to lose myself in the action, delightfully repetitive, and oh so peaceful. My very own backyard ('cause that's where all the horses are :o) Reading so many blogs about boarding barns, travel to horses time, and and all the related hassles and headaches helps me to remember how very blessed I am to be able to have all of ours right here with us. Did you know Joy Beaston, or Sherron McCoombs, or Stephanie Stephens, or... Geez I can't remember names. Yes, I knew all of them! I have lost contact though, except for Joy who I saw a while back. She still works at the CVM. There was Paige too who had been there forever. Paige and Bajeera (her grey tb)!!! I guess I have 2, one active and one passive go-to places. I love being down by the run-in,no matter what the weather--rainy, windy & cold, feeling the elements. Something about being next to those big warm bodies in the winter or appreciating the shade in the hot, Texas summer. After I put my horse down last year, it was hard to stand there because of the decades of equine memories, but I stood there and let them flow. Now I have another horse. The active one is when I drive past my fenced in arena, I always think of cantering around on Khanalee and going over jumps, about 14 years ago. I feel the joy, the rhythms, being more youthful (40's as opposed to 50's.) They are active and passive peaceful feelings, but they are definite places to go. My happy place is that I have never ever had to board a horse. Always had the family farm. The horses come to the kitchen window for treats. When the horses have their noontime lie down, they stretch out near the house (with the cats). I don't have to listen to stupid questions from strangers, or worry about people pestering my horse when I am not around. I don't have to worry about a horse being away from my care. No strangers, no drama, no alcoholic barn workers, no people who don't pay board, no one steals any tack, no one put nails in another horse's feed. These are all the anecdotes I have heard from people who board. Every night at the barn, when I feed. I watch the sun set, listen to munching, smell the hay and warm horse bodies. My dog and I walk the pasture and fence line to see if the foxes have dug a new hole we have to fill in. Riding my horse through the woods in the fall, with rustling leaves everywhere, logs to jump, and a river to splash in. A friend from my barn wrote this for a college class less than a month before she died in a riding accident. It perfectly explains the barn as a happy place to get away. You may have been told this already... but Theys still exists as a horse farm co-op, under Theyland Stables. I half-lease a horse who's boarded out there; I was there this afternoon. The land is still owned by a - daughter? granddaughter? - of the same Mr. Theys, who has a different last name.